Jeffco K500 APOLLO Hair Dryer - Features easy-to-use digital time-temperature settings and automatic cool-down time. The built-in temperature probe and rheostat insures the selected temperature up to 150 degrees will be accurately maintained throughout the timed cycle. 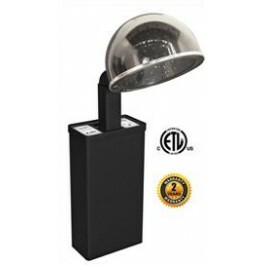 110 volts, 1400 watts, 13 amps.ETL approved for USA and Canada. Two Year Warranty. WA-300 Wheel Kit: Fits the K500 Apollo, 2200 Sol-Air, and most Highland Dryers.